What drew you to direct The Effect? The Effect is set in a clinical drug trial and the claustrophobic nature of this is fascinating. You have two people enclosed in a space they can't leave, while two doctors give them the medication and monitor the effect it has on them. But like all trials, some people have been given the drugs and some have been given a placebo. So are the feelings they experience real? Or is it the drugs? Or just a placebo? We get to watch the chemical reactions between all of them. The scientific and medical ideas the play explores are embedded in the drama of two young people falling in love, as well as the two doctors running the trial. The play explores the nature of depression, what causes it and how we treat it. One of the reasons I like the play so much is that you never get the feeling that it's taken sides. With things like medicine, neuroscience and anti-depressants everyone has an opinion but the beauty of this play is that it's able to present this story without judgement. That means everyone in the audience is going to have their own interpretation of it and their own experience of the play and I know they'll talk about it afterwards. Lucy Prebble is a young British writer, in her 30s, and The Effect is her fourth play - she was also the creator of the TV series Secret Diary of a Call Girl. 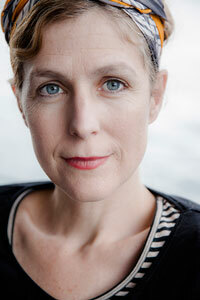 She's a very exciting writer who takes a lot of risks and often deeply investigates the subject she's writing about. She's got a fabulous sense of humour, so she's able to mine the big ideas and reflect the dark side of life with this wonderful warmth and sense of the ridiculous. Yes, there's actually a great story there. Angie is playing the role of the female doctor and Eugene Gilfedder is playing the male doctor. Eugene is a fabulous actor from Brisbane who's not often seen here in Sydney, but he really is remarkable. When I told Angie that Eugene was going to be playing opposite her, she was delighted because it turns out he was one of the reasons she became an actor in Brisbane. So, I think bringing those two together is going to be very special. They've got very different qualities to them but they'll be perfectly matched as the doctors. What can you tell us about the characters who fall in love? Oh yes, Connie and Tristan. They're from completely different worlds, with very different outlooks on life. Connie is a real stickler for detail, she's very cautious. And Tristan has this kind of blistering optimism. They're thrown together in this drug trial, where they're part of a group of young people who aren't allowed to leave, or use their mobile phones, or have physical contact with each other or the outside world. They just have to stay there and be given these anti-depressant drugs and be observed by the doctors. So, you're watching these people interact, and you don't know whether the drugs are responsible for what they feel. Does it matter if they are? The internal and external tensions this creates are fabulous to watch on stage. I think the two actors playing the young couple, Anna McGahan and Mark Leonard Winter, will be an exciting match for each other as they thrash out these effects like two fighting fish in the same bowl!